My newly seventeen year old son, Iced T (his current choice of blog persona) , arrived home today from a 10-day trip which took him from Charlotte to Lake Geneva, Wisconsin for the Club 420 Nationals then on to Michigan State in Lansing for engineering camp. By all accounts, it was a grand adventure. He and his partner Patrick finished 5th in the regatta of 60 boats — better than any of us expected. And he had a great time, enjoyed the independence and made a lot of friends at engineering camp. His birthday was last Monday so a celebration is overdue. 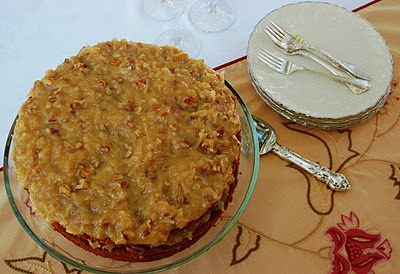 Warren Buffet (current blog persona for my younger son) and I are planning to make my mother’s absolutely divine German Chocolate Cake with Coconut-Pecan Frosting. 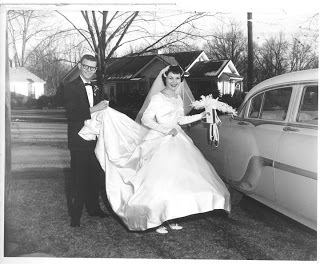 Growing up in the Mississippi Delta in the 1950s, my mom was served cake every Sunday. Six days of the week, my grandmother Mimi made a pie. On Saturday, she baked a cake as well. And on Sunday, she went to church then came home to a bounteous lunch with delicious cake for dessert. Mimi baked an impressive array of cakes, all from scratch — Devil’s Food or Angel Food with 7-minute Icing, white cake with caramel icing and pecans on top, and one she called 1234 cake. She iced yellow and white cakes with fudge-like cooked chocolate icing, white cakes with coconut icing and, at Christmas time, made her special Jam Cake. 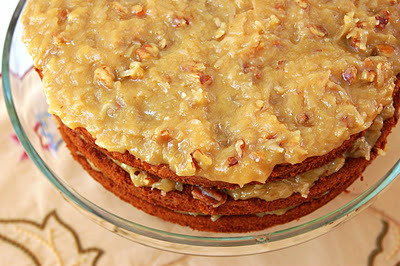 But, according to my mom, she never made a German Chocolate Cake. After her freshm an year at the Mississippi State College for Women (now the Mississippi University for Women) — a somewhat improbable choice in my view — my mom transferred to Ole Miss where she met my dad while working on his successful campaign for 1959 editor of the student newspaper, The Daily Mississippian. At some point during her sophomore year, her sorority sister Eleanor Becker’s aunt arrived from El Dorado, Arkansas with a German Chocolate Cake with Coconut-Pecan Frosting for her niece’s birthday. In my mom’s words, she “thought that she’d died and gone to heaven”. I’m not sure my boys are familiar with that expression, but they pretty much feel the same way. Eleanor’s aunt was happy to share the recipe. My mom used it to bake the cake for years until the frayed recipe card washed away with much of the rest of the lower floor of our family home in Hurricane Katrina. Now she uses the recipe from the inside of the Baker’s German Chocolate package. I’ll confess that I plan on cheating a bit. My altitude of 3500 feet makes baking cakes from scratch a losing gamble. So my plan is to use a Betty Crocker German Chocolate Cake and doctor it up with extra eggs, some sour cream and vanilla. If you don’t have altitude issues, give the real thing a shot! One tip of my mom’s is that when baking cakes, always use pans that you only use for cakes. Otherwise, the layers may stick. Cut 3 rounds of parchment paper to fit the bottom of a 9-inch round pan. Spray the bottoms and sides of 3 9-inch round pans with cooking spray, then line the bottoms with the rounds of parchment paper. Combine the german chocolate and water in a microwaveable bowl on high, stirring every 30 seconds until the chocolate is almost melted. Remove from the microwave and stir until the chocolate is completely melted. Beat the egg whites in a bowl with the mixer on high speed until stiff peaks form and set aside. Combine the flour, baking soda and salt in a bowl and set aside. Beat the butter and sugar in large bowl with mixer until light and fluffy. Add the egg yolks, one at a time, beating well after each. Add the melted chocolate and vanilla and blend to combine. Add the flour mixture alternately with buttermilk, beating until well blended after each addition. Fold in the egg whites, stirring gently until well blended. 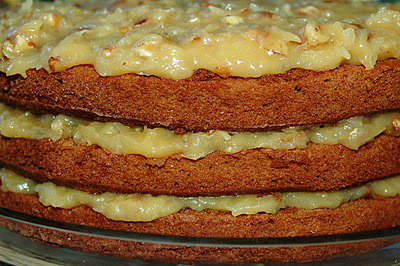 Bake the cake for 30 minutes or until a toothpick inserted in one of the centers comes out clean. Immediately run a small spatula around each of the layers. Cool the layers in the pans on wire racks for 15 minuntes, then remove the layers from pans and set on wire racks to cool completely. While the cake cools, make the frosting by combining the egg yolks, milk and vanilla in a large saucepan, whisking until well blended. Add the sugar and butter and cook on medium heat for about12 minutes or until thickened and golden brown, stirring constantly. Remove from heat and add the coconut and nuts. Stir well to combine. Cool slightly to desired spreading consistency. Spread the frosting between the cake layers and on top of cake. Of all the wonderful cakes that my mom makes, this one is probably my family’s favorite. The cake is beautifully moist and the perfect delivery system for the oh-so-yummy frosting. The boys enjoy it with big glasses of white milk. I like it with a Pinot Noir after dinner or a cup of coffee at breakfast. Good cake doesn’t last long around here!